Preview the Upcoming Adventure Tour! Cecelia Jurgens is an elected member of the Canadian Society of Painters in Watercolour. 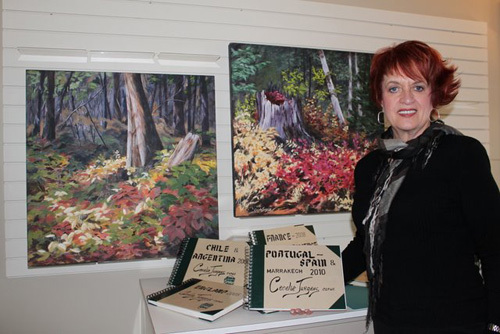 She is also an Active Member of the Federation of Canadian Artists. Cecelia is best known for her contemporary paintings, celebrating colour and light. She enjoys working in the diverse mediums of watercolour, acrylic and pastel. She has been in group shows since l987, and solo shows since l998. In 2001 the Deputy Chief of Protocol for the Provincial Government commissioned Cecelia to do six paintings which were presented as gifts to International Dignitaries from the Province of Saskatchewan. Her work is in private, public, and corporate collections across Canada, the United States, Europe, the United Kingdom, Russia and Africa. Since 1999, Cecelia has been teaching Art Workshops. These workshops vary from Basic Drawing, Beginner Watercolour, Intermediate and Advanced Watercolour, Fun with Acrylic, and Ink and Watercolour Sketchbook Workshops. In 2004 Cecelia began her Sketchbook Workshop Adventure Tours! These Sketchbook Adventure Tours have taken place in Italy – Rome, Tuscany and Umbria regions; England – Windsor, Stratford-Upon-Avon, Cotswold Villages and the Lake District; South America – Chile, the Andes, and Argentina; Western Canada – the Hoodoos and Rockies; France – Paris and Provence area; Spain, Portugal, and Marrakech, Morocco; Greece – Athens, Mykonos, and Santorini, Canada's Newfoundland, a European fairytale tour featuring Amsterdam, the Black Forest & the Alsace, and again Italy to discover its dramatic Amalfi Coast. The wonderful Quebec City, Quebec. Now Cecelia is looking forward to the upcoming Sketchbook Workshop in Magical Ireland! Working as a full time artist, Cecelia has her own studio gallery at home in Saskatoon, Saskatchewan. Cecelia’s work is also carried by Collector’s Choice Art Gallery in Saskatoon.